Analysts expect Apple to sell 48 million iPads this year, with new hardware and software driving the sales. iPad3 is right around the corner, and today Apple unveiled (watch here) a new initiative that will bring textbooks to the iPad/iPhone platform. Download the latest version of the iBooks app and you can now purchase textbooks (typically for about $14.99) that feature enhanced materials such as 3-D models, searchable text, photo galleries and flash cards for studying. (To see it all in action, download a section of E.O Wilson's Life on Earth textbook here.) And if you're a teacher, Apple will provide you software - iBooks Author -- that will let you make your own interactive textbooks. Of course, all of this presupposes that students (or cash-starved schools) can swing the price of an iPad ($499 at minimum) and that teachers want to oblige students to work within Apple's closed ecosystem. These courses now appear in our collection of 400 Free Online Courses, which aggregates free courses available on iTunes, YouTube, and the web. I’m a university professor who also creates online material for my students and for commercial publishing firms. Right now, the only motivation for a university author to use ibooks author to enhance text is if Apple pays to have it done or if the the author is in a position to require his or her own students to purchase a particular text – which happens to be authored by the professor. It’s not open for all users. Neither of those situations is in the best interests of the student and I cannot in good conscience ask my students to pay even more (to require an iPad) than they already are forced to pay. I require purchase of an online supplement to textbooks and that they own a clicker to use in my class. All this while a new textbook can run $175 in the campus bookstore. It’s far too early to know that iPad is the default choice of students for reading. In fact, I see more students reading with a nonilluminated source like Kindle. Apple seems to come out ok in most of what they do but this seems like a bad move. I hope it doesn’t push students into a situation where they have to pay even more. A college student can easily drop $500 on books in a semester. As a student facing at least 8 semesters of buying books, I’d be more than willing to buy an iPad my first year if I knew that my books would never cost me more than $15 each. I love my I-pad and it had replaced my laptop in many things but, just out of curiosity, I downloaded the section of “Life on earth” you mentioned in your post above and it “ate” 2GB, I mean 2GB of my total space!And this was just a secion of 1 book! If Apple plans to promote this interactive books they will have to come up with I-pad devices having huge storage space and what will be the price considering even the 16GB version at the moment is more ecpensive than many laptops on the market! I don’t see it coming very soon. I just added one factoid to the post — books will generally run about $14.99, which frankly isn’t bad. The fact that these books eat up storage is a big negative, that’s for sure. But you can probably guarantee that models with more GBs will be here soon. I suppose most majors may benefit from this. But for me, in my 4 years of college, I’m positive that I’ve spent less than $500 on textbooks and that’s because I primarily went to libraries for the required reading and if the text wasn’t available at the library, I’d buddy up with a friend and we’d split the cost. Now for art supplies, I’m sure I’ve spent at least a grande! 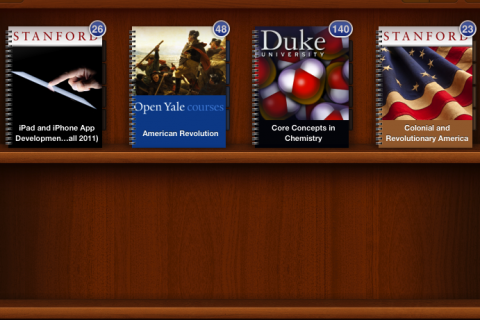 We are considering using iTunes U as a platform to support our students. I have been trying to find out what Apple charges the institution to put content in iTunes University. I see that it is free to the users. Is the same true for educational institutions, or can I just not find the page with the pricing?